Preheat the oven to 180°C/gas 4. Halve the peppers lengthways. Remove the seeds and white ribs. Put in a baking dish, toss in 2 tbsp olive oil and arrange skin side down. Cover with foil and bake for 1 hour. Meanwhile, gently fry the onions in 3 tbsp olive oil until soft and golden. Set aside. Rinse the lentils and put in a saucepan with the bay leaf and 500ml cold water. Cover and bring to the boil, then remove the lid and simmer for 15 minutes. Add 1/3 of the sautéed onions and the rice. Season, bring up to a simmer, cover and cook gently for a further 15-20 minutes until both the rice and lentils are tender. The liquid should all be absorbed. While the rice is cooking, add a further 2 tbsp oil to the remaining onions and return to a medium heat. Stir regularly until they have caramelised and are crisp and golden. The peppers and lentil rice should now be ready. Put the onions in a sieve and drain their oil into the rice. Mix, and adjust the seasoning. 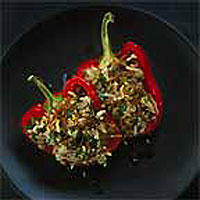 Arrange the peppers on a serving dish and fill with lentil rice. Arrange the caramelised onions over the rice. Mix the parsley and lemon zest and scatter over the peppers. Serve warm or at room temperature, with seasoned yoghurt.